Our latest offerings are awesome! Tired of hearing the keys offers only shallow reefs? We are very proud of our reefs here in Key West. We have big fish, and some really great reefs that are world class. The only problem is most people don't know about them! Well, we finally decided we had enough of being rated second place to the rest of the Caribbean and we are going to take you to more places than ever. While we continue to be a world premier destination for novice divers, we now offer to take our more experienced divers to our little known DEEP REEFS for some drift dives! Whatever your experience level, we have something fantastic for you. GO TECH! Subtropic Dive Center is proud to announce its increased support of Technical Diving. Subtropic has been the only dive shop on the island to offer advanced Nitrox fills and we've always welcomed the tech community. But now you can earn your Technical Certifications here as well. Take an Advanced Nitrox, Decompression Procedures, Extended Range, Entry Trimix, or Advanced Trimix course. Interested in going tech? Contact us right away for more information. Latest Vandenberg update: On May 15, 2008, the 520 ft, 13,000 ton Gen. Hoyt S Vandenberg will become the Key's largest artificial reef. Join us for sink week. 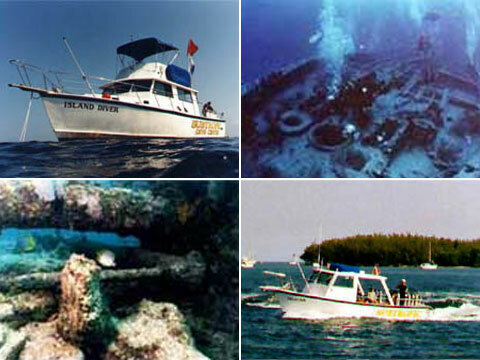 Check out the Artificial Reef of the Keys web site for more information. Subtropic Dive Center is REEF's (Reef Environmental Education Foundation) newest field station in the lower keys. Actually, we're going to be the ONLY dive shop in Key West that is a REEF field station. We'll keep you posted on what we'll be offering in conjunction with REEF and fish counting/identification trips. In the meantime, check out REEF's website for more information on what they do. Or ask us about a FISH count dive - a great way to enhance any dive or snorkel trip to our reefs!!! Did you enjoy your trip with us at Subtropic? Give us feedback and if you can take the time to fill out a questionnaire go to Scuba Diving Magazine's Reader's rating page and let them know how we did! We use multiple sources of information for our weather assessments, and would like to share them with you. Since living and working on the water is our business, we rely heavily on NOAA, the National Hurricane Center, and the National Weather Service. These sites offer some interesting information on weather and are a great way to help forecast the weather for you trip to the Keys. Check out Ocean Conservancy's web site they participate in all sorts of conservation programs and we team up with them periodically for cleanup dives. They are a wealth of information. Also check out REEF for more information on fish counts, fish id, and other great conservation news. If you are coming down for vacation, we're excited to have you here! We offer all sorts of fun specialty dives if you are looking for something to add a little more excitement to your trip. Think about getting your Nitrox certification, take the wreck specialty course, get your deep diver card. There are many fun courses you can take that require little extra effort than the dives you will already be doing. Check out our instruction page for a quick listing of the specialties we can offer. Call or email us to set up your dives! We continue to offer Enriched Air Nitrox (EANx) services. We can fill NOAA Nitrox I and NOAA Nitrox II. We also offer classes to get you certified as a NAUI or PADI Enriched Air Nitrox Diver.